Having a Service Dog | Crockett Foundation - Tag In & Help Out! I spoke with a Veteran recently whose Post Traumatic Stress Disorder (PTSD) symptoms include dreaming of people who have committed suicide – who he doesn’t even know. For humans who have PTSD that affects them in nightmares a Service Dog can be ready to work even while sleeping. The Crockett Foundation helps fund the best Veterans charities out there, who are providing Service Dogs to Veterans with PTSD. You may read about their mission and donate to help improve the lives of Veterans regaining joy in life while living with mental illness such as PTSD. When Service Dogs are sleeping, sometimes they’re still on duty. When this Veteran punches the ghost next to him in his sleep it’s often his Service Dog who’s occupying that space. When the dog is awakened by a thrashing human it might help his person by poking or licking him. This is just like when a person’s poking you or me. Eventually we stop ignoring them and pay attention to who’s poking us. We’re forced to focus on the here and now. We become mindful. It reminds me of what a herding dog would do with sheep. More so, like when my dog ‘boinks’ me on my calf with her nose – all the way to the kitchen to make sure I don’t stray away and forget to feed her. For a person to legally qualify to have a service dog, they must have a disability that substantially limits their ability to perform at least one major life task without assistance. To qualify as a service dog, the dog must be individually trained to perform that major life task. When they’re off duty they can play with other dogs and humans like many other dogs can. One thing you won’t find, though, is an on duty Service Dog with it’s human at a dog park. They can’t be expected to properly serve their human if there are lots of other dogs running all over the place in play mode – who are expecting the Service Dog to play too. Another Veteran with PTSD who’s currently looking for a trained Service Dog is a survivor of Military Sexual Trauma (MST). She lives with a lot of anxiety about her and her kids being attacked. She desperately needs a dog who will search each room in her house before she and her young children enter. For activities in everyday life, like shopping for groceries or being outside with the kids playing in the yard, a large sized Service Dog can stand behind her. In military lingo that’s the “got your six” position, as on a clock – where the hand is down on the number 6 with you standing in the center of the clock. By always touching her backside the dog let’s her know she need not worry about what’s back there. A small Service Dog can be the ears of someone who’s deaf. There’s a woman I know (who’s not a military veteran and doesn’t have PTSD) who is deaf and her little Chihuahua sits on her lap and is trained to recognize her human’s name, and other key phrases that are important. When the dog hears those words he alerts his human that someone’s speaking to her. This can help in crowds, group meetings, or even out to dinner with the family. As employers or business owners there are laws about what we can ask someone who enters the building with a Service Dog. An excellent resource for information on what a Service Dog is, or is not, is this Americans With Disabilities Act (ADA) webpage. The following paragraph tells us what we can or cannot legally ask of someone who enters our facility with an animal that appears to be a Service Dog. To learn about the difference between Post Traumatic Stress (PTS) and Post Traumatic Stress Disorder (PTSD) read the blog post here. 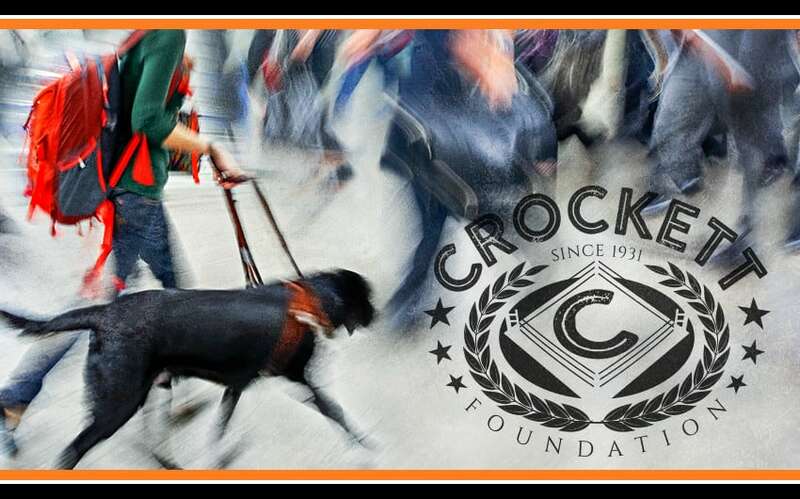 You may donate to the Crockett Foundation to help support the costs of training Service Dogs and helping US Military Veterans living with PTSD.